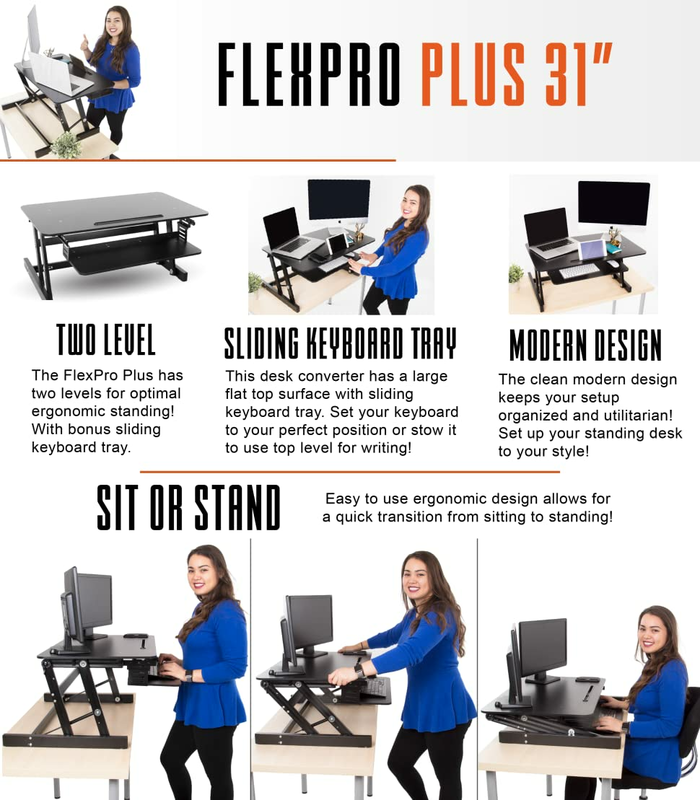 The FlexPro Plus 31” Sit Stand Standing Desk Converter delivers everything you’ve been searching for in a standing desk converter – powerful pneumatic lift, dual-levels for better ergonomics, a sliding keyboard tray, and a BONUS tablet/phone holder slot built-in! PNEUMATIC LIFT: Strong and reliable dual-pumps assist lifting and lowering the FlexPro Plus 31” Sit Stand Desk Converter! ADJUSTABLE HEIGHT: Choose your most comfortable standing height then secure the locks located on both sides, near the back of the desk, to set it securely in place! TWO LEVEL SURFACE: The top monitor level of the FlexPro Plus 31” can accommodate two monitors (or one monitor and a laptop), plus it has a tablet/phone slot built-in! The keyboard tray provides plenty of space for your keyboard and mouse. SLIDING KEYBOARD TRAY: The keyboard tray is retractable in both sitting and standing positions so that you can further adjust your typing position. This feature is missing in many similar desks! GET HEALTHY: It’s time to stand up to sitting disease, have more energy, burn extra calories, and reduce back pain by standing at work. You can do this! Start standing today and make your office and workstation ergonomic and pain-free! From the customer service to the desk itself, I’ve been completely happy!! The customer support, provided by Jenny, was super helpful. And the stand up desk itself is a great product! Highly recommend!! My rating is based on initial unpacking, testing, quality, and light usage. I am doing a bit of dyi construction work on office and wanted an updated desk. This is my first time considering a standing desk. FlexPro had a good line and made it on my wish list after researching, but what pushed me to purchase now was an opportunity to buy open box. It was in perfect condition and it operates very smoothly. It feels sturdy when I have it in standing mode and typing. Other than getting used to standing, it seems like same desk experience either sitting or standing. The only reason I’m giving this 4 stars instead of 5 is that the wrench they give you to put the keyboard tray on doesn’t quite fit the bolts. Otherwise, it’s great! Bought this for an employee and she loves it. Plenty of room for both monitors and when it is folded down, it is the perfect height for her. I will be buying 2 more for other employees to enjoy! I love my Stand Steady Desk. My first one had issues with the preassembled rail so I had to return and repurchase. It's great for my height which is 6-feet. One has to be careful not to lean on the keyboard tray in the standing position so it doesn't damage the desk.